Product information "Typhoon H Plus (UK Version)"
Meet the next generation of Typhoon H - a hexacopter even more powerful than before and with an all new flight controller, based on PX4. Creatives will benefit from the C23 one-inch sensor camera. Capable of high resolution 20 megapixel stills and 4K video at 60fps, the C23 camera allows users to capture imagery in captivating detail. Boasting an improved low-light performance from previous models, the upgraded camera features larger aperture optics and an extended ISO range. The sensor provides exceptional dynamic range and improved signal-to-noise ratio. The camera is integrated with a 3-axis gimbal capable of continuous rotation for 360° image capture. Six rotors allow unparalleled safety and stability in the aircraft. The design allows you to reliably capture ultra-stable footage even in windy conditions. The Typhoon H Plus is one of the quietest drones in its class, with a 40% reduction in noise from previous models. In the event of motor failure, the six rotor design enables the Typhoon H Plus to remain in flight with only five motors and land safely. The ST16S Ground Station is an integrated transmitter, receiver and Android platform that gives you full control over Typhoon H Plus, allowing you to easily program autonomous flight and capture stunning photos and videos. The large 7-inch integrated screen displays real-time footage of your flight, eliminating the need for an external device. Adjust manual camera settings, access flight telemetry and browse the internet all from the smart controller. Follow Me/Watch Me: Follow Me ensures Typhoon H Plus moves along with you. Watch Me tells Typhoon H to follow you while always pointing the camera at you wherever you go. Orbit Me: Typhoon H Plus flies a circular path around you, keeping the camera trained on you the whole time. Point of Interest: Select a subject and Typhoon H Plus will orbit that subject autonomously. Journey: Typhoon H Plus will go up and out, as far as 150ft, and capture the perfect aerial selfie. Curve Cable Cam: Easily program an invisible route for Typhoon H Plus to fly along. 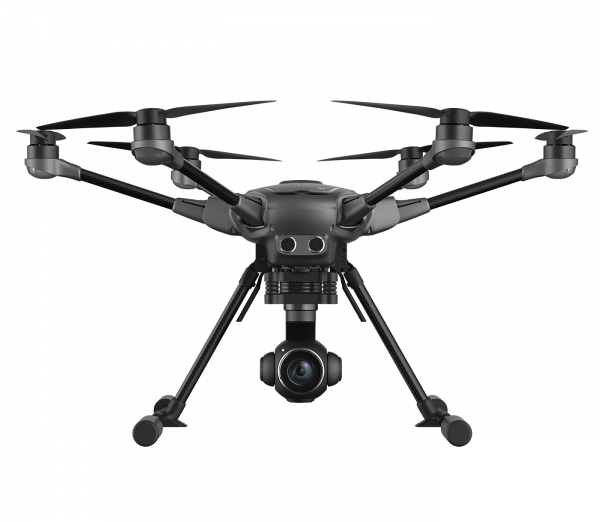 Typhoon H Plus will fly between pre-set coordinates while independently controlling camera position. Return to Home: Simply switch to Home Mode and Typhoon H Plus will return and land within 26 feet (8 meters) of you. Typhoon H Plus Hexacopter, C23 camera, ST16S remote control, 2x battery, charger, neck strap and sun shield for ST16S, SD card and other accessories. Related Links "Typhoon H Plus (UK Version)"
H520 / Typhoon H Plus Propeller Quick Lock "A"
H520 / Typhoon H Plus Propeller Quick Lock "B"